Inspection of all major fasteners is an important part of every major service on a Harley Davidson. 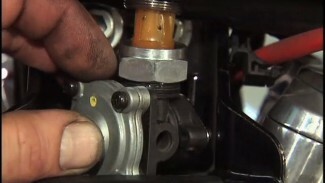 Failure to maintain the Harley clutch lever and all fasteners can result in damage or injury. After many repeated service procedures and/or repairs, hardware and threaded castings can become stripped or damaged. Install thread repair inserts when threaded holes in castings become stripped, damaged, or not capable of withstanding their specified factory torque. Replace bolts, nuts, studs, washers, spacers, and small common hardware whenever missing or damaged. Clean up or repair minor thread damage with the correct tap or die or, if possible, a thread chaser. Always follow the specified service manual procedures when addressing the Harley clutch lever hardware and all fasteners that contain threadlocking agents when fastener replacement is needed. When re-using fasteners with threadlocking agents, thoroughly clean the fastener and threaded hole(s). Always use the factory recommended threadlocking agent for the specific procedure.